The Class of 2018 at Orange’s Canyon High School held commencement on June 14 at Fred Kelly Stadium. SANTA ANA — Authorities say a bomb threat emailed to some students at the Orange County School of the Arts in Santa Ana was not credible — but nevertheless police plan a large presence there Thursday. About 20 students received through social media an anonymous threat that there would be a bomb on campus Thursday, according to school officials. The students were alerted to the threat via a social media platform called Sarahah, school officials said in a letter Wednesday to parents, faculty and staff. Out of an abundance of caution, Orange County Sheriff’s Department deputies and Santa Ana officers will be present at the school Thursday, Santa Ana police Cpl. Anthony Bertagna said Wednesday night. ANAHEIM >> Anaheim Elementary School District Superintendent Linda Kimble announced Tuesday she has accepted a similar position with the Vista Unified School District in San Diego County. The Vista school board voted unanimously tonight to appoint Kimble. She will begin the job in early January. Kimble became superintendent of the Anaheim district in 2012 after serving as superintendent for the Monrovia Unified School District. During her tenure, the district implemented a district-wide music curriculum and passed a $318 million bond measure intended to improve school buildings and facilities across the district, according to Keith Sterling, the district’s director of communications & public information. The district’s board is expected to discuss the search process for a new superintendent at its Wednesday meeting. ANAHEIM —Students at Savanna High School will continue to call themselves the Rebels, but their longtime mascot, Johnny Rebel, will become a thing of the past. Jeanne Tenno, a member of the first graduating class in 1963, spoke through tears as she explained the slogan ‘Rebel Pride’ was about cleaning up the campus, being kind to fellow students and having an award-winning marching band. WHITTIER — Two weeks after terminating Whittier Christian Elementary School’s lease to use Maybrook Elementary School, officials at the Lowell Joint School District said they hope to find a replacement private school to operate the campus that served 288 students last year. Meanwhile, the operator of the current school vows to stay put, possibly forcing an eviction. The school board voted July 31 to terminate the lease and on Monday, it voted to encourage a new operator by promising to shield the newcomer from potential lawsuits. Whittier Christian is scheduled to begin classes Aug. 24, but Lowell Superintendent Jim Coombs said the district is prepared to go to court to evict the school from the campus at 11700 Maybrook Ave. The district includes part of La Habra. Once the campus — previously the site of a public elementary school — is available, Lowell has one possible candidate, Heights Christian Schools, in mind. Heights Christian operates a junior high, one school for fifth- and sixth-graders, three elementary schools, and five preschools. Claud Lamar, president and CEO for Heights Christian, told the board Monday his organization was interested in taking over the campus and asked Whittier Christian parents to call his district office in La Habra Heights. Lowell terminated the lease held by Calvary Baptist Church, which since July 1994 had rented the site for use as Whittier Christian Elementary School, for two reasons, Terry T. Tao, attorney for Lowell, said in an Aug. 1 notice of termination. First, in July 2016, Calvary officials decided to get out of the school business as financial demands became too much and subleased the campus to Carnegie, Pastor John Ploog said. However, the district’s lease with Calvary doesn’t allow for a sublease, Tao wrote. Second, Carnegie planned to bring seventh- and eighth-graders onto campus, which also is forbidden under the contract, he wrote. “This lease has been in place since (July 1994) and the board has made its standing practice to have elementary students only,” Coombs said. Reached by phone Tuesday, James G. Schwartz, Carnegie’s attorney, denied his client was going to bring seventh- and eighth-graders onto the campus. “We were hoping to fold (the students) in, but we were told we couldn’t do it,” he said. However, district officials point to a letter emailed in March to parents saying the junior high would be moved to the Maybrook campus for the 2017-18 school year. Coombs also said a number of Whittier Christian parents have told them seventh- and eighth-graders were on the Maybrook site during the summer for activities and other classes. It looks like Lowell may have to go to court to regain control of its campus. Calvary officials have said they will not fight the termination of the lease and in fact have canceled its agreement with Carnegie and support the eviction, Ploog said. Lowell’s problems with Carnegie began last spring when the school didn’t pay the nearly $20,000 monthly rent for April, May and June, Coombs said. The rent was eventually paid with interest and fees. Whittier Christian Elementary School is not related to Whittier Christian High School. Over posole, ceviche and handfuls of tortilla chips, parents of Cal State Fullerton students chatted in Spanish with one another, too anxious to quite enjoy the moment. The potluck dinner in May brought them together so Julián Jefferies, assistant professor of literacy and reading education, could allay their fears. Their children were about to embark on a 3,300-mile trip – for some the first time they had been out of California or on an airplane. A few weeks later, those students were sitting, blindfolded, around a bonfire at 4:30 a.m. on a small island in Puerto Rico as the sun rose and a handful of wild horses walked toward them along the beach. Their parents could hardly have imagined. “I warned the parents and the students they were going to come back and they were going to change,” said Miguel Martinez, college career specialist for the College of Education, who accompanied the students, all the first in their families to attend college. The 15 students returned home with new inspiration, motivation and career goals. Some want to change their career focus; others had a new interest in applying to graduate school. And with the exception of one visit to the hospital, all went smoothly. The two-week trip by the Literacy Education for Social Change class has become an annual tradition for Jefferies, a strong believer in the power of experiential learning – getting out of the classroom to learn by doing. He took the class to Vieques, an impoverished, rural island where the U.S. Navy conducted bombing and other military exercises for 60 years. The class members helped establish a community farm, cleaned archives, worked at a radio station and conducted surveys of island residents. Their experience also included professional and personal development, highlighted by a short lecture by Martinez calling the students fakes. “That was one of the highlights of the trip, when Miguel called them fakes,” said Jefferies. But that’s putting the cart before the wild horses. Before the class set foot in Puerto Rico, the students had to learn to budget and to raise money – selling tacos at churches, setting up GoFundMe accounts – to supplement funding from the university’s Center for Internships and Community Engagement and the College of Education. But an equally tough task was winning over the parents, who worry about a child, especially a daughter, traveling alone. In some cases, the student is a caregiver for siblings or works to help pay the rent or phone bill, making a two-week absence a hardship. Parents often have trouble understanding why their child needs to leave campus to learn. That’s why Jefferies and Martinez hold the potluck. “For our culture, food is family,” Martinez said. Geography major Kevin Goxcon brought his mother and sister to the potluck. His mother, Ereida, said she was glad Kevin would acquire more knowledge so he can get ahead and had faith that everything would be all right. Gerardo Marquez said he was glad his daughter, Otilia, was getting “out of her cubicle” to get to know the world, as it shrinks and integrates culturally. “So I’m sort of pushing her,” he said. For their part, the students were so busy on the trip they barely had time to miss their families, Jefferies said. Some worked on an organic farm – weeding, sowing and harvesting – as part of a nonprofit’s efforts to grow more produce on the island. The decades that the Navy used the island for military exercises left it with little indigenous agriculture; produce must be imported from China via Florida, taking so long that much of it ends up decaying, and expensive, by the time it reaches Vieques. “A lot of our students are from low-income communities in Santa Ana, Anaheim or Fullerton,” Jefferies said. Issues of access to healthy food are not just found in Puerto Rico. Many minority communities in Orange County have fewer options to buy fresh fruit and must pay more for it than other communities, he pointed out. Students especially responded to a panel of local women activists who protested against the Navy, and the contamination it left behind, or in favor of more health care on the island. Studies have shown rates of cancer, diabetes and cardiovascular disease on Vieques sharply higher than elsewhere in Puerto Rico. When one student experienced an allergic reaction and needed medical care, the only option on the 9,300-population island was a run-down clinic with one doctor and three nurses. “I left the hospital worried for Viequenses,” said Estefania Gutierrez-Guerrero, a senior majoring in human services. The class landed in Puerto Rico after two months of student protests at the University of Puerto Rico over proposed budget cuts. Three leaders of the student strike stayed with the CSUF group for two days. “They were very impressed by the fact that students had basically closed the university for two months in protest,” Jefferies said. Another timely event was the June 11 referendum on Puerto Rico’s statehood, which passed overwhelmingly. The students collaborated with a UPR professor to conduct exit interviews with about 300 people early that morning. The activities and speakers opened the students’ eyes to social justice work, Jefferies said. Last year, one student realized that Vieques, with few jobs or opportunities and little to do but cruise up and down a one-block stretch, is similar to his hometown of Santa Ana, Martinez said. Surrounded by affluence, Santa Ana’s just a different kind of island. While working on the farm in Vieques, some students learned there is a community garden in Santa Ana, inspiring them to volunteer in their own communities. Along with such discoveries came more personal ones, Jefferies said. He brings Martinez along on his trips to continue professional development lessons he incorporates into his CSUF classes. “We’re working on them as professionals, but a lot of it is personal,” Jefferies said. “They don’t believe in themselves, don’t think they can do it or have some kind of limitation.” He says a lot of the young women aren’t used to speaking up in class, even though their writing shows they have a lot to say. Some students hide their knowledge at the dinner table because they don’t want to be accused of being a know-it-all among less-educated family members. To address that, Martinez woke up the students at 4:30 a.m. one day and took them to the beach, where Jefferies had started a bonfire. Martinez asked them to write down on a cloth strip three obstacles holding them back. They put the cloth around their shoulders to feel the burden of that limitation, then blindfolded themselves with it to symbolize how it blinds them. Then they threw the cloths into the fire. Then, as the sun came up, a family of horses came walking up the beach. While that morning was cathartic for many of the students, it was another session with Martinez that provided the jolt many needed to commit to real change. After the UPR students spoke about their protest, showing how much they are invested in their college, Martinez challenged the CSUF students to really commit to being a college student, saying they were just pretending. “It’s almost like it’s become college is their hobby. It’s not who they are,” Martinez said. They wear a Cal State Fullerton T-shirt, but it’s like a costume. As CSUF has grown as a commuter school, a lot of students don’t stick around after class, apply for jobs on campus or go to baseball games, he said. Instead they have a part-time job and do their classwork at home. “I hope I didn’t go overboard,” said Martinez, who added that he wants them to see they are leaders in their community. As the students were called out for their level of commitment, they also received a dose of ethnic pride as they spent most of the trip conversing only in Spanish and living and working among the Puerto Rican people. I have this newfound motivation to better myself in order to help others that are facing the same challenges as me. There might be a high school student right now who thinks they cannot afford to go to college or they don’t have what it takes. Perhaps there is a community college student somewhere right now wondering if transferring to a four-year institution is something they can achieve. There might be several students receiving their bachelor’s degree who are not pursuing graduate school due to lack of information or support. I was once in all of those situations. I need to be ready for when I meet these students in the future. Otilia Marquez: One thing I quickly learned about Vieques, Puerto Rico, is that they are a collectivistic culture! Unselfish and willing to help the community, unite as one, and stand up for what they believe in! They don’t have much to offer to anyone, neither to themselves, materialistic-wise, however, they have it all if they stick together! The island has suffered enough, both individually and as a whole, yet they love freely, speak freely, and always find a way to make a difference. A woman who helped me understand the importance of women empowerment was Nilda. … She was part of the protests to remove the Navy, and she continues to fight for Vieques. Something she said that made an impact on me was that protesting can be done through different ways. For example, every morning she would put on a shirt of a certain color and then walk around the plaza. This act of protest is still powerful and meaningful even if it is not with a big group of people. What I understood by that is that you must stand up by yourself, and the right people will join you. My culture isn’t bad! I always thought it was lesser than American, always scared to accept it as part of me but now I can say I am a PROUD CHICANO. I have a better picture of who I am and how I operate and can use that to push myself more. My identity is starting to cement and I can say I am proud of who I am now, knowing I can help make a difference in other people’s lives. I love my culture now and I am actively studying it, I want to know everything, especially the history and dancing … still don’t like a lot of the music though. Originally I wanted to be a social worker and pursue my master’s in education. But then Miguel said, “I picture you teaching junior high in Santa Ana.” Everyone else said they could picture that: “You’re a big dude, sometimes intimidating. But inside you’re like a teddy bear.” There are not that many male, of color, teachers. Maybe I should start teaching. Mayra Mendoza: There’s a solidarity that the Vieques people have. It doesn’t matter if you are from Vieques. As long as you want to help the community, they’re willing to help you help them. Anthony Flores: I learned so much from everyone out there. I would share something on Facebook. I wanted things to be known. Now, I don’t just want to sit back and share it on the internet. Now I want to know what can I do to help. Vanessa Beltran: I would like to bring my experiences and what I learned over there and be able to teach them to my family and friends and my community here, to stand up for what we want. Maricela Gonzalez: I was interested to see a body of students actually take action, go to this assembly, voice their opinions and their rhetoric. I haven’t dealt with situations of that magnitude. It’s their way of voicing out their way of what they want for their university. It was really good to see. To tap the desire for change that the trip often elicits, CSUF career specialist Miguel Martinez conducts career exploration workshops with the students. He has them write a statement of purpose to start reflecting not just on what they’re doing but on what they’re not doing, and administers a RIASEC test, which matches six personality types (realistic, investigative, artistic, social, enterprising and conventional) to occupations, then helps them interpret the results. Some students were disappointed, said Julián Jefferies, assistant professor of literacy and reading education. They had trouble imagining themselves in the careers the test guided them toward. But it turns out they didn’t know much about many of those careers, he said. For example, one student who is good with money was annoyed when she was matched with financial jobs. She said she didn’t want to work in a bank; she wanted to help people. But when she was told she could conduct financial literacy workshops for people who get into debt and don’t know why, something clicked. Since she returned home, she got her resume together to apply for those kind of jobs. “Her parents aren’t professionals,” Jefferies said. “Where is she going to hear: ‘You could be a loan officer’”? Many students on the trip typically start thinking about graduate school for the first time, something they then have to explain to parents who thought it was enough to put their child through college. Jefferies expects many students will seek out the Career Center now that they’ve made that connection with Martinez. They came back hungry, wanting to develop an action plan for grad school, Martinez said. Jefferies also hopes students will stay connected with the CSUF faculty and staff on the trip – who shared their stories of the struggles that brought them to where they are today – and seek out office hours and group events. Some have become his research assistants. Parents holding down two or three jobs each. Families doubled and tripled up in cramped apartments. It is not all bad news, but Orange County’s new Community Indicators Report, an annual study by government agencies, businesses and philanthropies, points to many woes woven into the fabric of the county’s sunny suburbs. One thread links them all: a calamitous shortage of affordable housing. 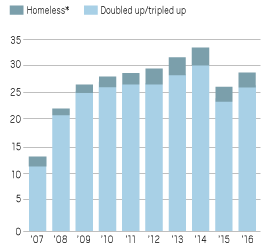 “Clearly, homelessness, overcrowding, and family financial instability are directly linked to high housing costs,” warns the 74-page data-rich report released last week. “But other factors are indirectly linked. When families spend 50% or more of their income on housing, they have less remaining to pay for health care and healthy foods, affecting overall health. 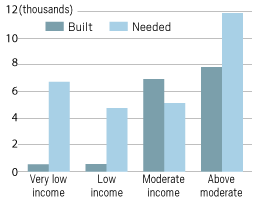 If the housing crisis continues, the report predicts, the result will be “a persistent and growing underclass,” while higher-income residents bear the burden of supporting a swelling elderly population. — At 3.7 percent, the jobless rate is lower than that of California or the U.S. In 14 of 19 high-tech industries, its employment concentration is higher than the national average. — At 5.4 percent, the overall high school dropout rate is lower than the state’s 9.8 percent. Course-taking in career technical education related to science, technology, engineering and math (STEM) jumped 40 percent over two years. — The proportion of residents without health insurance sank to 9 percent in 2015 from 17 percent in 2013, in the wake of the federal Affordable Care Act. The number of poor children with health insurance grew by 40 percent. — While many communities resist affordable housing projects, a few are being built with city governments’ support, including in Yorba Linda and Buena Park. “We are losing our millennials and Zers,” Lucy Dunn, president and CEO of the Orange County Business Council, a trade group for the county’s largest companies, told a group of 150 executives and government officials at an Orange County Forum gathering last week. — To afford a median-priced, one-bedroom rental unit, an hourly wage of $27.62 is needed. Yet 68 percent of Orange County jobs pay below that. 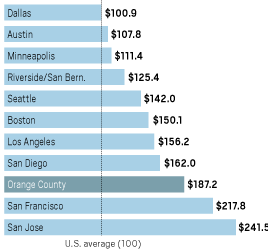 — Orange County’s cost of living is almost double the U.S. average (87% higher). Housing costs are 356% higher than the national average. — Residents 65 and older are the only group projected to grow proportionate to other age groups in the next 25 years. –Nearly 60,000 households are on waiting lists for government rental assistance. Michael Ruane, an affordable housing executive who was the county’s project director on its first indicators report 17 years ago, said the data show “there are two Orange Counties. Tourism jobs—some 200,000—make up one of the biggest sectors in the county, along with business and professional positions, and healthcare and social services employment. But jobs in theme parks, hotels and restaurants pay far less than other large sectors: $24,300 a year on average, with thousands of workers making the minimum wage of $10.50 an hour or slightly above. 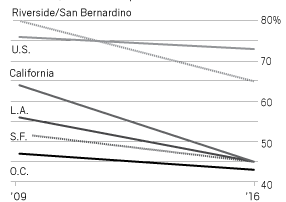 Anaheim, home to Disneyland, Orange County’s largest employer with 28,000 workers, is one of the poorest cities in the county, the report notes, with its highest high school drop-out rate (11.5 percent). Racial and ethnic disparities are stark. Latinos, on track to grow from 35 percent to 40 percent of the county’s population over the next two decades, experience far more poverty, less access to health care and worse educational results than non-Latino whites (42 percent of the population) or Asians (19 percent). “Parents work two and three jobs, even on weekends, to make ends meet,” said Al Mijares, county superintendent of schools. The report makes no policy recommendations, but Mijares, whose department is one of the report’s sponsors, said publicly-funded universal pre-kindergarten would be the single biggest boost to educational success. Georgia, Florida and Oklahoma have enacted statewide pre-K programs, but California has yet to fund a comprehensive program. Kimberly Goll, executive director of the local Children and Families Commission, said Orange County is the first in California to measure and track factors affecting kindergarten readiness in all its school districts. Among the 48 percent who enter kindergarten unprepared, some lack motor skills—too much screen time, not enough crayons and physical play, according to some experts. Others lack emotional and cognitive development. 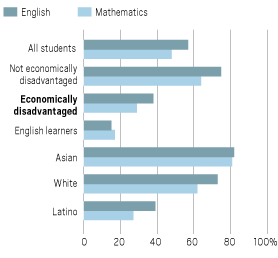 Last year, a third of Orange County eleventh graders failed to meet state literacy standards, while 57 percent failed in math. Still, efforts are ramping up to prepare students for higher-paid jobs requiring STEM skills. Thanks to a state grant, 14,000 high schoolers participate in OC Pathways, a program offering courses and industry contacts in three areas: Health Care/Biotechnology, Engineering/Advanced Manufacturing and Information Technology/Digital Media. If demographics are destiny, then the county’s population trends are daunting. The age 65-and-older group will grow from 14 percent today to 26 percent of the population by 2040, the report predicts. The number of working-age residents for each dependent (children and the elderly) will shrink from two to one. “The fewer people of working age, the fewer there are to sustain schools, pensions and other supports to the youngest and oldest members of a population,” the report notes. Cities often prefer retail development, which brings in sales tax revenue, to multifamily housing, which sparks political opposition. Even luxury housing is controversial: in March the Newport Beach City Council rescinded its approval of a 25-story project for million-dollar condominiums after opponents threatened a referendum. Hospitals, for instance, should “have hundreds of units of apartments in conjunction with their facilities,” he added. Open land is scarce, but as shopping centers begin to retrench under the e-commerce onslaught, struggling retail areas can be converted to housing, the report suggests. “Underutilized retail corridors may be the only viable option for increasing the supply,” said Ruane, who heads an Urban Land Institute initiative to assess the potential. In Yorba Linda, National CORE, where Ruane serves as executive vice president, built Oakcrest Terrace, a 69-apartment complex for low-income families on the site of a former car dealership. The city contributed about 20% of the funding. In February, Jamboree Housing Corp., an Irvine nonprofit, opened Clark Commons, a 70-apartment complex for low-income families on the former site of a city maintenance yard and blighted retail center in Buena Park. The city contributed $7.7 million in loans. One testament to the housing shortage: Clark Commons has a waiting list of 2,500 families. Orange County’s home building 2014-2015 was mostly for higher incomes. Only 43 percent of first-time buyers have the necessary income ($92,000/year) to qualify for buying an entry-level home, down from 52 percent in 2009. 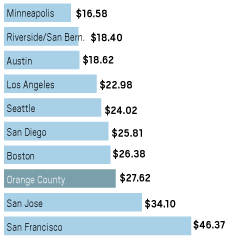 In Orange County, a $28/hour wage is needed to afford a one-bedroom apartment. Orange County is 87 percent more expensive than the national average. More than 28,000 students are homeless, doubled-up or tripled up with other families. Under 30 percent of poor students meet state math standards. Under 40 percent meet literacy standards.